The Book of Mormon narrative tells of two epic battles that took place on a hill named Cumorah. According to Joseph Smith, he found these records buried in a hill in Manchester, New York, a few miles from his home. Since 1829 this hill in New York has been called the Hill Cumorah. 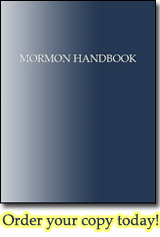 Joseph's translation of these alleged records is published as the Book of Mormon. If the Book of Mormon narrative were true, then this hill where these two epic battles were fought should be an archaeological gold mine. However the LDS church has not permitted any formal research or excavation there. Instead it constructed a visitor's center and holds an annual pageant there. That the Book of Mormon's Hill Cumorah is in New York poses a problem for some modern Mormon apologists who deem that the Central America and its ancient ruins are a better fit for Book of Mormon geography than New York. Those who advocate this position are at odds with General Authorities. The Church has long maintained, as attested to be references in the writings of General Authorities, that the Hill Cumorah in western New York state is the same as referenced in the Book of Mormon. The Prophet Joseph Smith himself is on record, definitely declaring the present hill called Cumorah to be the exact hill spoken of in the Book of Mormon. Further, the fact that all of his associates from the beginning down have spoken of it as the identical hill where Mormon and Moroni hid the records, must carry some weight. It is difficult for a reasonable person to believe that such men as Oliver Cowdery, Brigham Young, Parley P. Pratt, Orson Pratt, David Whitmer, and many others, could speak frequently of the Spot where the Prophet Joseph Smith obtained the plates as the Hill Cumorah, and not be corrected by the Prophet, if that were not the fact. That they did speak of this hill in the days of the Prophet in this definite manner is an established record of history..."
Doctrines of Salvation, Vol.3, p.232-43. This second civilization to which I refer, the Nephites, flourished in America between 600 B.C. and A.D. 400. Their civilization came to an end for the same reason, at the same place, and in the same manner as did the Jaredites’. Both the Nephite and Jaredite civilizations fought their final great wars of extinction at and near the Hill Cumorah (or Ramah as the Jaredites termed it), which hill is located between Palmyra and Manchester in the western part of the State of New York. Joseph Smith, Oliver Cowdery and many of the early brethren, who were familiar with all the circumstances attending the coming forth of the Book of Mormon in this dispensation, have left us a pointed testimony as to the identity and location of Cumorah or Ramah. This time it will have to do with so important a matter as a war of extinction of two peoples, the Nephites and the Jaredites, on the self same battle site, with the same 'hill' marking the axis of military movements. By the Nephites this 'hill' was called the 'Hill Cumorah,' by the Jaredites the 'Hill Ramah'; it was that same 'hill,' in which the Nephite records were deposited by Mormon and Moroni, and from which Joseph Smith obtained the Book of Mormon, therefore the 'Mormon Hill,' of today—since the coming forth of the Book of Mormon—near Palmyra, New York. The hill, which was known by one division of the ancient peoples as Cumorah, by another as Ramah, is situated near Palmyra in the State of New York. The great and last battle, in which several hundred thousand Nephites perished was on the hill Cumorah, the same hill from which the plates were taken by Joseph Smith. Finally, they became so utterly wicked, so fully ripened for destruction, that one branch of the nation, called the Nephites, gathered their entire people around the hill Cumorah, in the State of New York, in Ontario County; and the Lamanites, the opposite army, gathered by millions in the same region. Thirty-six years prior to this time his nation was destroyed in what we term the State of New York, around about a hill, called by that people the Hill of Cumorah, when many hundreds of thousands of the Nephites—men, women and children, fell, during the greatest battle that they had had with the Lamanites. Cumorah, the artificial hill of north America, is well calculated to stand in this generation, as a monument of marvelous works and wonders. Around that mount died millions of the Jaredites; yea, there ended one of the greatest nations of this earth. In that day, her inhabitants spread from sea to sea, and enjoyed national greatness and glory, nearly fifteen hundred years.-That people forsook the Lord and died in wickedness. There, too, fell the Nephites, after they had forgotten the Lord that bought them. between these hills, the entire power and national strength of both the Jaredites and Nephites were destroyed. With the absence of archaeological evidence casting such a large shadow of doubt over the Book of Mormon, that the church has not had the hill excavated is telling. The rational must be that it is better to wonder what is in the dirt than to find out and be disappointed.